Joseph Reilly’s family have been searching for him for over 10 years to no avail. THE MYSTERY OF a man whose body was buried unidentified in Louth 10 years ago has now been solved using the DNA of two of his siblings. The man’s body washed up on a beach in Louth in 2007 but detectives have been unable to pin down his identity until now. A new DNA database launched in 2015 has helped gardaí with over 600 crimes including murders, sexual assaults and hundreds of burglaries. It helped identify that the man’s body is that of Joseph Reilly, who was 50 years old when he disappeared in 2006. Reilly’s family have been searching for him for over 10 years to no avail – until September. “The more time that went on, the more likely it was that we weren’t going to see Joe again,” Reilly’s brother Gabriel told RTÉ News. 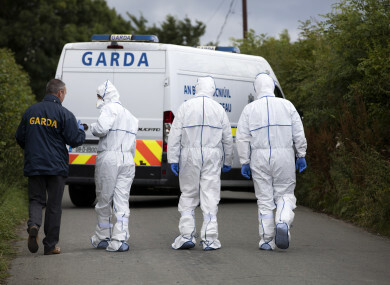 Gabriel Reilly and his brother were approached by Forensic Science Ireland in May and asked if they wished to donate DNA samples to try to see if their brother was one of the unidentified bodies. They did so in May and discovered in September that Joseph Reilly was the body that washed up on the beach in 2007. Speaking to RTÉ Radio One’s Morning Ireland, Forensic Science Ireland’s Dr Dorothy Ramsbottom explained: “We have had major advances in DNA technology. We can now work on samples that we previously couldn’t work on before. Joseph Reilly’s body was washed up at Rockmarshall Beach six months after his disappearance. His body had been in the water for some months which made it difficult to get a solid DNA profile, leaving him unidentified until now. “The sea water is very corrosive and it’s sometimes very difficult to get a DNA profile from a person who has been in the water. Luckily, in the case of Joe Reilly, we were able to generate a case back in 2007,” Ramsbottom said. Once the database was launched in 2015, Reilly’s unidentified body became one of the hundreds of mysteries to be solved. An annual report from the FSI published in May revealed the database is linking one in every five crime scene samples to individuals. Some 9,048 profiles were uploaded onto the database by the end of 2016 and it linked 385 people to specific crimes – in some cases multiple crimes. This included two murders, five sexual assaults, 295 burglaries, 42 robberies/thefts and 57 cases of criminal damage. Gabriel Reilly said it has been a relief to finally find out what happened to his brother. “It’s something that’s been hard to come to terms with because his disappearance has been a mystery and we’ve never really understood it,” Reilly said. Email “New technology solves mystery of unidentified body found 10 years ago using siblings' DNA ”. Feedback on “New technology solves mystery of unidentified body found 10 years ago using siblings' DNA ”.